Mistakes are entirely too common in the operating room, but they might not be as innocent as they appear. A national regulating agency has so many precautions in place to prevent these mistakes that it's difficult to assume a doctor's innocence when something still goes wrong. The Joint Commission, an accrediting body for hospitals nationwide, is widely recognized for the high standards it demands to ensure quality care for patients. In 2003, the Joint Commission established a Universal Protocol for Preventing Wrong Site, Wrong Surgery, Wrong Person Surgery. With so many precautions in place, it's almost impossible to make an innocent mistake on what surgery is to be done. If the entire process is followed correctly, any mistakes should be caught right away and corrected. If you or a family member has been the victim of a wrong surgery, it's possible that someone on the surgical team failed to follow this required process. If so, you may have a case for a Missouri medical malpractice lawsuit. 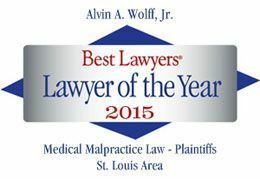 For a free consultation with an experienced Missouri medical malpractice attorney, call Alvin Wolff at 314-241-2500. We'll also give you a free copy of our book, The Guide on How to Pick a Lawyer.